You’ve browsed local used car dealership inventories online, found the car of your dreams, and now you have to figure out how you’re going to pay for it. When you have poor or damaged credit, not knowing if you are going to be able to qualify for a loan to finance a car can be a big concern. Luckily, special financing options are available to car buyers with bad credit, so-so credit, and no credit. So don’t worry, you can still secure a car loan even if your financial records are less than perfect. However, if you aren’t working with a credible dealership, you may risk getting into a subprime auto loan that you don’t understand. High Q Auto wants you to fully understand the pros and cons of special financing auto loans. We understand that people have made financial mistakes in the past, and it’s important to start making the right moves, especially when it comes to making an investment in a pre-owned car purchase. What are the Advantages and Disadvantages of Subprime Auto Loans? The ease of approval is probably the top benefit when it comes to subprime vehicle financing. Many people run into financial difficulties at some point in their lives due to a variety of reasons. Whatever the circumstances may be, nobody actually wants to get into a bad credit situation that will make it difficult or impossible to obtain a standard vehicle loan, but that is the unfortunate reality. Thankfully, subprime auto financing opens doors for car shoppers who have previously fell on hard times, providing them with an opportunity to get the loan they need to purchase a new or used vehicle, in spite of their current credit situation. Obtaining special financing gives people the opportunity to build or rebuild their credit score to prime status. Consistent on-time auto loan payments will improve your credit score overtime. Depending on how much and how quickly your credit score improves, you may be able to refinance your current subprime vehicle loan at a better interest rate down the road. In the future, you will be able to obtain a better loan and monthly car payment on your next vehicle purchase because you have proven your creditworthiness by making timely payments on your subprime loan. As you can see, interest rates can affect your monthly payments to the point that it can come between what you can and cannot afford. Additionally, when obtaining a subprime loan, processing fees and other fees related to the loan are also a higher price. The higher interest rate and higher fees compensate for the risk of lending money to those without a strong credit history, so the bank can collect more money from you in the event you default on the loan. A loan for 72 months, 84 months, or even 96 months could be beneficial in terms of your monthly budget because it breaks up the total cost of the car into the smaller more affordable payments. However, the enticement of a lower monthly payment can distract from the percentage rate which adds to the total price of the car overtime. The loan may seem affordable now but, you end up paying significantly more for the car once the loan is paid off. Where Can I Get Car Loan Financing? 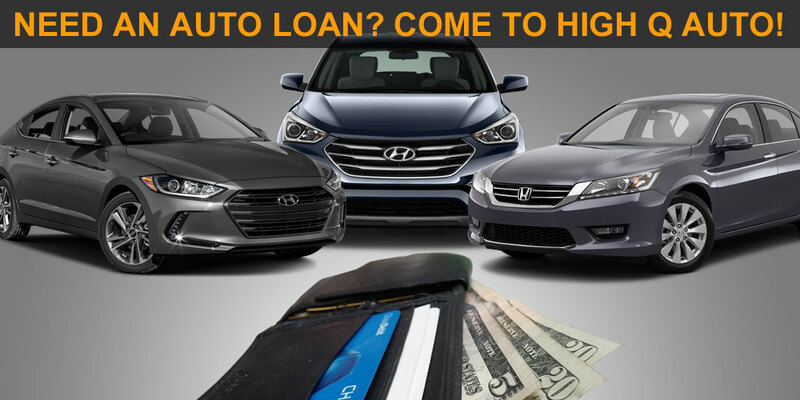 If you have been looking for a quality used car dealer in Hollywood Florida, High Q Auto can help you get used car financing with rates you deserve. Getting a car loan with bad credit in Hollywood can be risky if you’re not working with the right dealership, so make sure you only deal with the best and come see us so you can get the best used car deals in Hollywood and the best auto financing for your needs.